Ever thought about capturing a queen, amassing real estate gold, or striking down a zombie or two? For centuries, games have stimulated the imagination. They have divided, and they have united. They have driven our competitive spirit and indulged our fancy. Live an entire lifetime in a few rolls of the dice. Unfortunately, due to sales rights restrictions, we cannot offer Games’ Most Wanted for sale in your country. 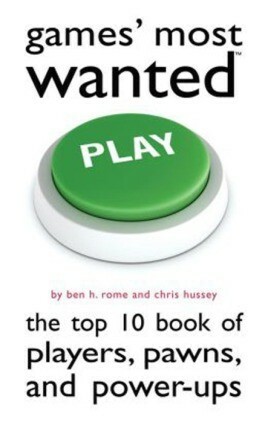 With more than forty chapters, Games'Most Wanted™ whisks readers away into the fantasyland of games. Learn more about board games that have been passed through generations, video games that predict the future, and card games that have brought down the house. Ben H. Rome and Chris Hussey also reveal the culture behind the entertainment—the codes of conduct, the language, the conventions, and the workshops— proving that leisure can be a lifestyle. Something they won't reveal: how to rescue the princess. Regardless of the hand you're dealt, Games' Most Wanted™ is sure to cure any boredom. An Origins Award-winning game designer and writer for more than a decade, BEN H. ROME has written and developed projects for Catalyst Game Labs, Fantasy Productions, FASA, and the International Spy Museum. As a web journalist and photographer, he has covered numerous exhibitions at National Geographic, the Smithsonian Institution, and other DC-area museums. A former resident of Orlando, Chicago, and Pittsburgh, he and his wife now call the Washington, DC, metro area home. CHRIS HUSSEY serves as the marketing director for a local television station in Iowa, where he's earned several Emmy®nominations and has been honored with a National Edward R. Murrow Award for Best Documentary. He also serves as the marketing director and cohost for Fear the Boot, a podcast devoted to the role-playing game hobby. Among his writing credits, he's authored and contributed to several projects for FASA, Alderac Entertainment Group, 4 Winds Fantasy Gaming, Kenzer & Company, and Catalyst Game Labs. Originally from northern Minnesota, he now lives in Iowa.